Without further ado, here's a single image random dot stereogram (SIRDS) for viewing. This one simply has the letters "3D" in it, floating over the background. The SIRDS is a single image which cleverly contains two images merged together, with hidden cues that the brain can use to see a 3D image within the apparently random black and white dots that make up the image. As entertaining as the black and white random dot stereogram images are, adding a little color can make stereograms even more interesting. In the next example, the random black and white dots are replaced with random colored dots. Even more exciting, by rotating 3D objects and creating a stereogram for each position, animated GIFs can be made to generate 3D movies, as in the following two animated images (fan on the left, a pendulum on the right). 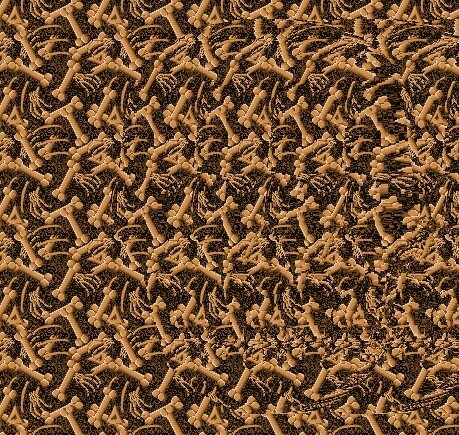 Finally, stereograms which use images for the background, rather than random dots, are even more interesting to view as this next example shows (it's a 3D skull on a background of bones). The first stereograms used two separate images - one for each eye. The two image random dot stereograms are easy to create and by looking at how one is made you get a very good sense of what must be done to an image to allow the brain to perceive 3D content. Single image random dot stereograms carry the concept further by merging both images into a single image. There's more information on this technique elsewhere in this site. To create a double image random dot stereogram, start with the following two identical images which are simply filled with random dots. Then copy a small area of one of the pictures, such as the marked square in the following example. In the next section, Concepts, the technique for creating a single image stereogram is introduced.